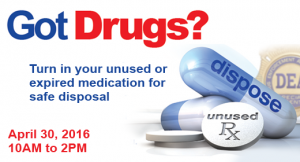 Freehold: The Monmouth County Sheriff’s Office is pleased to announce that it will once again be participating in National Prescription Drug Take Back Initiative on April 30, 2016. That’s the day to dispose of unused, unwanted and expired medicine. The statewide event, spearheaded by the Drug Enforcement Administration (DEA) New Jersey Division, raises awareness of prescription drug abuse. Prescription drugs are considered a gateway drug to other serious and dangerous street drugs, such as heroin. In 2015, 107 people died of opiate/heroin related overdoses in Monmouth County and that habit may have s tarted in the medicine cabinet, since prescription drugs are considered a gateway drug to other serious and dangerous street drugs. According to the 2014 National Survey on Drug Use and Health, 6.5 million Americans abused controlled prescription drugs. The same study showed that a majority of abused prescription drugs are obtained from family and friends, including from the home medicine cabinet. This Drug Take Back Initiative enables us to get our unwanted, unused and expired medicine out of our homes and to law enforcement agencies for proper disposal. The drop off location for the Monmouth County Sheriff’s Office will be at 2500 Kozloski Rd, Freehold from 10am to 2pm, where a sheriff’s officer will be present. All medications should be deposited in the drop off box provided by the DEA. The program is anonymous and no questions will be asked of participants. In addition to participating in National Drug Take Back Initiative, the sheriff’s office has a permanent collection site, located at front entrance to the Monmouth County Sheriff’s Office, which residents can utilize Monday through Friday from 8:00am to 4:00 pm.